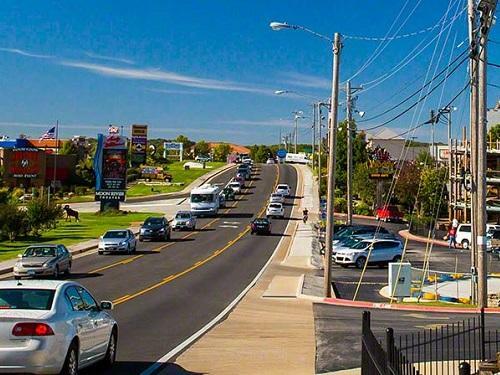 Branson has started work on one of the biggest and most ambitious Complete Streets projects in Missouri, and the world. 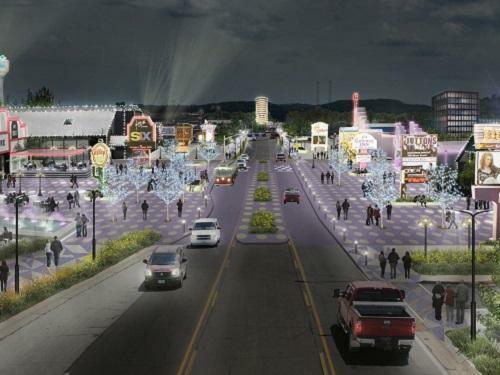 The Spirit of 76 Project will give the Branson “strip” – where theaters and tourist attractions line the street and vie for the attention of 7.5 million visitors annually – a completely new and more attractive look. For years, Highway 76 through Branson has been a challenge to navigate by pedestrians and vehicle traffic alike. Given that it is a national tourism center that attracts millions of out-of-state visitors annually, literally by the bus and car load, city officials determined it is time to give the traffic-way a greater level of attention. Branson is never lacking for vision and new development for the area. Incremental improvements along the strip have been moving forward for years, such as the sidewalks and crosswalks you see on Highway 76 today. Local advocates listed Hwy 76 intersection improvements for pedestrians among the state’s High Priority Bicycle/Pedestrian/ADA Project List back in 2010. But several years ago community leaders decided it was time to move the project up a notch. They started working with MoDOT and exploring funding options and a new vision for the area. As the project gained momentum, tourism attractions and theaters along the route have started to recognize the value of the project. Not only will the project make their attractions literally more accessible to visitors who walk, bicycle, or are disabled, the streetscape project becomes the front door to the attractions and theaters. Because of this dynamic, attractions and businesses along the Highway 76 strip are contributing over $40 million in donated and in-kind contributions to the basic $80 million project. The Complete Streets project is pretty sizeable for a rural town of 11,000 that has never before given much thought to pedestrian accessibility! But it makes a lot more sense when you consider the tourism and economic impact to the Branson region generated by Hwy 76 shows, restaurants, and attractions. The new Branson Spirit of 76 Project will literally drive new business to those that have served as the “heart beat” of Branson for nearly 50 years. The entire five-mile 76 Revitalization Program will be completed in a five-year period, that includes the 8 main segments and a handful of smaller, more manageable segments to minimize any disruption to traffic, visitors and business operations during construction. When completed, not only will overhead utilities be removed, but West Highway 76 will be transformed to enhance visitors’ experience with landscaping, wide sidewalks and overall streetscape charm that includes an intelligent transportation and traffic control system.